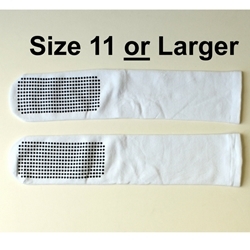 This is our new BARIATRIC non slip sock. It is designed to stretch over very large feet. It is made of 80% cotton, 15% spandex, and 5% elastic. The spandex and elastic combination allows this sock to stretch to fit most size feet. Our socks are made of high quality material and are meant for repeated use. Most of the standard hospital socks you will find on the market are meant for short term use and will fall apart after a few weeks of use. Watch this video featuring the sock below. The video shows the same sock but in black.